Here is an update from our lawyers, who are currently helping us in our ongoing legal battle with the Richmond Police Department over documents. Please read, and go to their link, and if you have the ability/inclination, donate to help them be able to take on more cases like ours. The law firm of Thomas H. Roberts & Associates, P.C., an affiliate law firm of Freedom Works Foundation, is proud to stand against prior restraints and censorship of speech protected under the United States and Virginia Constitutions. Freedom Works Foundation was founded in 1999 as a non-profit foundation in Virginia to defend against attacks on freedom, to promote, assure and enhance freedom. The American tradition stands in stark contrast to the English licensing system, which expired in 1695, where all printing presses and printers were licensed and nothing could be published without prior approval of the state or church authorities. All despotic and tyrannical governments attack the freedom of the people to speak. One of the more famous cases in the United States involved the attempt of the government to restrain the publication of the “Pentagon Papers”, the Vietnam Study Task Force report created by Secretary of Defense Robert McNamara, consisting of thousands of pages including documents classified as “Top Secret—Sensitive” At first President Nixon was not opposed to the publication since it was perceived to be embarrassing to the prior administrations of Kennedy and Johnson, but his National Security Adviser Henry Kissinger convinced President Nixon that the publication might establish a negative precedent. The administration then attacked Daniel Ellsberg and Anthony Russo, who allegedly leaked the documents, arguing that they were guilty of a felony under the Espionage Act of 1917. Attorney General John N. Mitchell and Nixon obtained a federal injunction ordering the New York Times to cease publication, which was appealed. Then Assistant United States Attorney General William Rehnquist unsuccessfully sought an injunction against the Washington Post, which was denied. Judge Murray Gurfein wrote that “[t]he security of the Nation is not at the ramparts alone. Security also lies in the value of our free institutions. A cantankerous press, an obstinate press, an ubiquitous press must be suffered by those in authority in order to preserve the even greater values of freedom of expression and the right of the people to know.” The government appealed. The United States Court of Appeals confirmed that the prior restraint of speech was unlawful, in a 6-3 decision with nine different opinions. The law firm of Thomas H. Roberts & Associates, P.C. stands behind police forces when they uphold and enforce the law — the firm opposes any police force when the power entrusted to it by the people for the people is used to oppress and rob those they are to serve of the benefit and protection of the law and the constitutions they have sworn to uphold. It is our sworn duty! Most recently in City of Richmond Police Department, et. al. v. Moriah Karn, et. al., Case No. CL 12-4939, the law firm of Thomas H. Roberts & Associates, P.C. 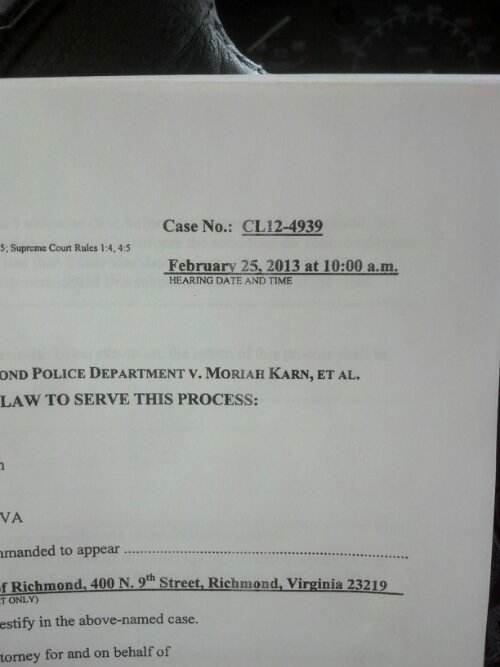 is defending Nathan Cox and Moriah Karn against the outrageous attack by the City of Richmond Police Department and the City of Richmond on their rights of free speech under the 1st Amendment to the United States Constitution and Article I § 12 of the Virginia Constitution. The suit does not allege who specifically posted the information online, but does allege that Karn and/or Cox posted links to the information on websites. The suit among other things seeks to prevent Karn and Cox from pointing the public to this information released to the public. The Richmond City Police Department and the City of Richmond have alleged, based on speculation, that the one or more of the defendants in this action (they don’t identify which one) have converted (taken possession or exercised dominion and control over) a portable hard drive that is apparently missing. Of course, as they have sued ten individuals whom they do not identify except as “Does 1-10”, so the defendants to this action could be anyone. They do not explain in their pleading how this hard drive was lost, when it was lost, or where it was lost. They do not describe what the hard drive looks like. They allege that the hard drive contains what they describe as “confidential” information or documents that has made its way into the public domain and was republished on various websites. The Richmond City Police Department and the City of Richmond allege that they are suffering and continue to suffer damages as a result of the alleged conversion of this hard drive and the loss of the documents on the hard drive. If the person in possession of this hard drive (if it exists or still exists) reads this post, some or all of the defendants would probably appreciate it if this hard drive were delivered to the clerk of the Circuit Court for the City of Richmond (see order below). 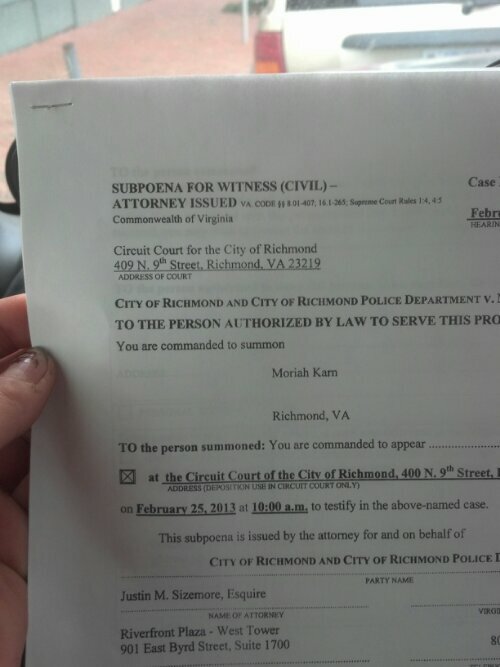 You may wish to consult an attorney since the Richmond City Police Department has threated criminal charges in what in the opinion of one or more of the defendants is not only a violation of the First Amendment to the Constitution of the United States, but also an apparent effort to cover up the incompetence related to the dissemination of the information that they claim to be “confidential,” apparently without adequate password protection or encryption. Defendants would appreciate it if you would notify counsel for Nathan Cox and Mo Karn if the hard drive is delivered to the clerk. We don’t know how long the files will be up, so definitely download your own versions of anything you are interested in. If anyone re-posts these files online please let us know so we can find them! We’d love to have them linked individually by title, but won’t be able to do so ourselves for a while. For more information on these files, look on a previous post below!